It's always sad when the temperatures start dropping and garden stuff starts to wither up, especially in Duluth where the growing season is so short, and especially for me because I guess I'm just not very good at container gardening because the plants don't start to mature until right about when the frost hits. 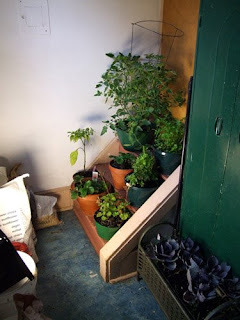 So this year I thought I'd experiment and try to extend the season a little bit, so I hauled my most robust tomato and pepper, the parsley and basil, the strawberries, geraniums, and the stupid cabbage that were just starting to form heads now, and I put them on the indoor landing outside my apartment and set up my old lightbox in front of them. It didn't really work for its intended purpose, but it is a Very Bright Light, and I thought maybe it could at least ripen a few tomatoes. 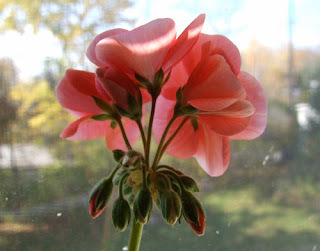 But the geraniums are soldiering on, too, and both of them are putting out flowers now, so they might make it though the winter. I think I'm going to ditch the lightbox and bring the geraniums in the apartment, once I find a sunny, cat-free place to put them.